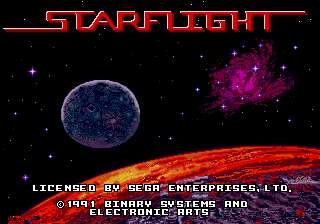 Starflight is a 1986 simulation game for home computers by Binary Systems and Electronic Arts ported to the Sega Mega Drive in 1991. You control an astronaut in a space program who uses the program's limited funds to set up a spaceflight that completes a variety of missions. You do this by first building your crew and ship, then taking them off into space to explore. Completing these missions gives the player MU (monetary units). Other very important sources of MU are digging for metals and suggestion planets colonization. Fuel usage, gravity, temperature, weight load etc. must be considered during all missions, enhancing the simulation experience. Compared to the PC original, most of the graphics have been updated. The game came with a space map as pack-in. The instruction manual contains the story of a starship captain, which can be used as a walkthrough, although not every item location was revealed. It should be noted that the player is never forced to actually complete a mission, one might fly and explore as long as there are enough resources. The game however has an ending that requires a sequence of discoveries to be made: Uncover the reasons for the so called "flaring" phenomena and destroy the source of it. The game got a sequel called Starflight 2: Trade Routes of the Cloud Nebula, but it was never ported to a Sega system.